Easy access from I-5 with a rural atmosphere. Lush landscaping & lake. All paved sites. Exceptional hospitality. All you expect at a quality resort: pool, hot tub, free wi-fi & newspaper at your door. Five tipis for rent. Five Tipis facing the Coburg hills, fully furnished and sleeping from two to six on comfy beds. Linens are provided along with a mini-fridge and coffeemaker. Enjoy your mornings or evenings on your deck with your own fire pit beyond. We stayed here mid-august and boy was it hot! We got a spot right on the pond with a great view and an opportunity to see the ducks swimming. We didn't fish the pond but we saw others fishing. They have 2 fenced dog areas. One is pretty small (10x10) and mostly gravel/sand. The other was much larger and gave our dog room to run out some of his energy. The office is really nice, the setting is beautiful. We were in a site that was the farthest from the Highway so we didn't notice the traffic nose. I would guess that there is likely significant noise if you are on a site closer to I-5. The closest grocery story was about 20 minutes away. Great for a 1-2 night stay, I don't think we'd stay for a whole week, though. We stayed here for 1 night while transitioning between maintenance appointments. 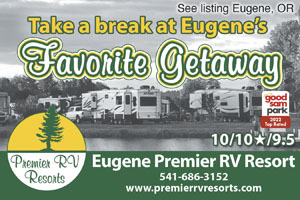 The Coburg-Junction City-Eugene area has a lot of RV repair/remodel facilities. The park is a very short drive from I-5 (Exit 199: Van Duyn Rd) along a 2 lane paved road. The park was adding more sites past the pond along the interstate. The sites are mostly P/T’s with a handful of back-ins. Some appear to be extended stay sites. The interior roads and sites are paved. The interior roads and turns are adequate that probably wouldn’t need to disconnect the toad until reaching the site but disconnecting made it easier getting to and adjusting in the site. The P/T sites were long enough for coaches & their toads. This park understands the simple concept of the importance of a flat, level site as the sites were level and flat. Distance, grassy areas and a short fence around the utility connections establish privacy between the sites. The older sites (#1-123) were closer to each other than the new sites. They have full hook ups – water, electricity (50/30/20 AMP), & sewer. The utility connections were easily accessed but the locations on some site would require disconnection of a toad or very long runs of hose/cords. The sewer connection was at the ground so it was easy to establish a downhill flow. There was an outside table but no fire pits as open flames are prohibited in the resort. There are trees scattered around the park so satellite reception would be dependent upon site assignment and your dish configuration. The park brochure showed 36 cable channels but made no mention of broadcast channels. Didn’t try to get any broadcast channels. The park provided WiFi was adequate. It was password protected. Our Verizon WiFi hotspot worked well. The NET10 phone worked well. The designated fenced pet areas were along the Eastern edge of the park. They had a well maintained grass surface. The designated pet area was at the entrance of the park. It was a well maintained grass surface. Both areas had bag dispensers and collection stations for waste. There was sufficient area to walk dogs along the park’s roads. Although there was a leash requirement, some tenants allowed their dogs off leash. The park was right along I-5, but strangely there wasn’t a lot of road noise. 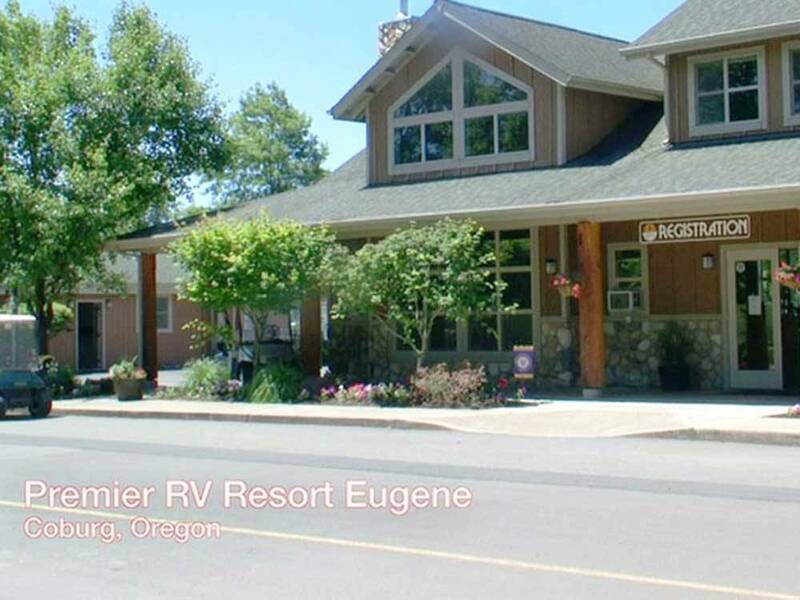 We would stay here again if in the area either traveling or obtaining RV repair but only for a short stay. Don’t believe we would use it as an extended stay location. Nice, level sites with easy access to facilities and grass areas near the water feature. Some pull-thru's are quite long for larger rigs. I stayed during a full on storm on this trip and there were no issues with water/flooding. Two dedicated off lease areas for dogs. The facilities are nice and secure. The park managers are very nice and helpful. There is a TA truck service station and a Camping World on the other side of I-5 for easy fueling or service needs. The park is located close to I-5 so there is some road noise, but I did not find it a problem. The location is excellent. Very friendly staff, thanks for escorting us to our site. I wish every campground would do that! Level sites, good water pressure good satellite reception but cable was fuzzy. Friendly ducks! Too bad it is not just a little further away from the freeway, quite noisy.